Is it still a humble storefront if it makes a bold claim on the marquee? If you’re familiar with this blog, you know that like most people I have a serious soft spot for a classic Italian hero. That means fresh, high-quality ingredients with a decent bang for your buck. Hardly the twain shall meet. Don’t get me wrong, it’s all-too-easy to get an Italian hero just about anywhere, but chances are it’ll be terrible. 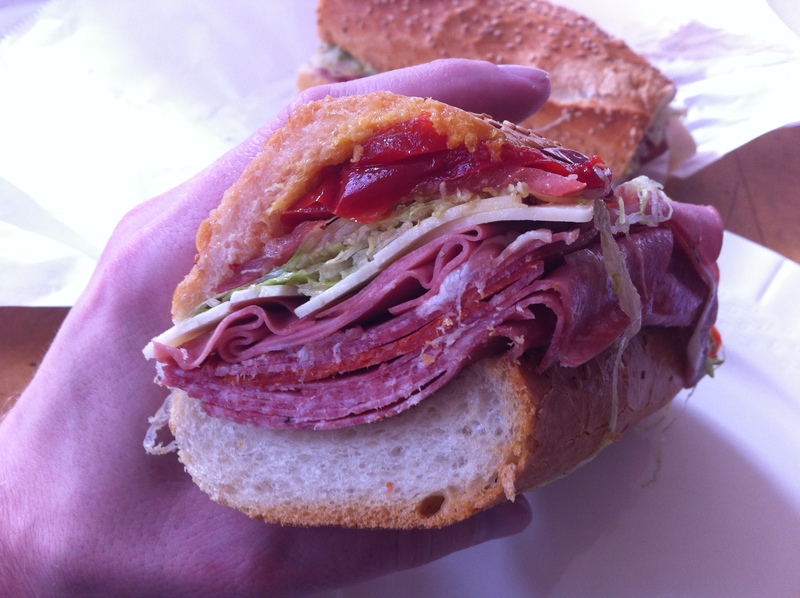 I’ve sampled the amazing Italian hero at Parisi’s Bakery, which I think might be “best in show,” the lovely one at Faicco’s on Bleecker, which has a crucial Achilles’ heel, the variation made at Carmine’s and numerous others over the years. 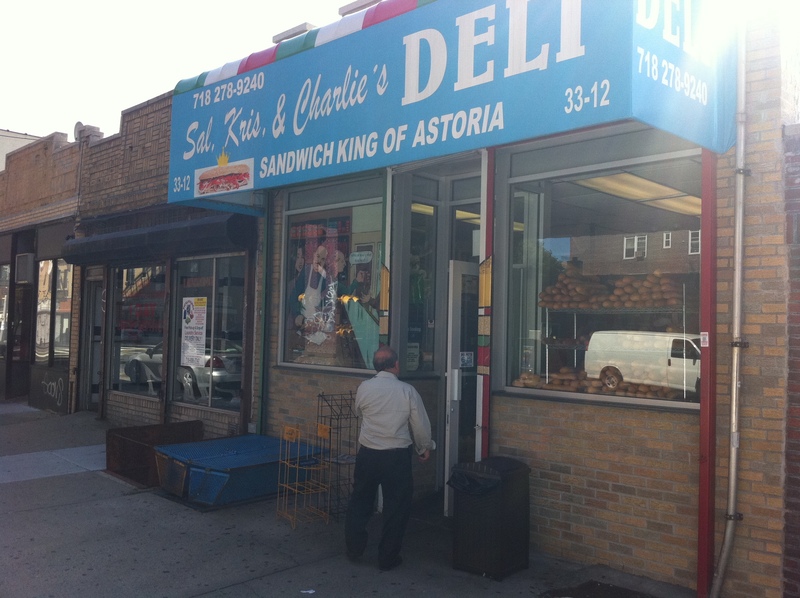 With that established, I can heartily recommend Sal, Kris & Charlie’s Deli in Astoria. Yowza. Seems like there’s always a crowd. 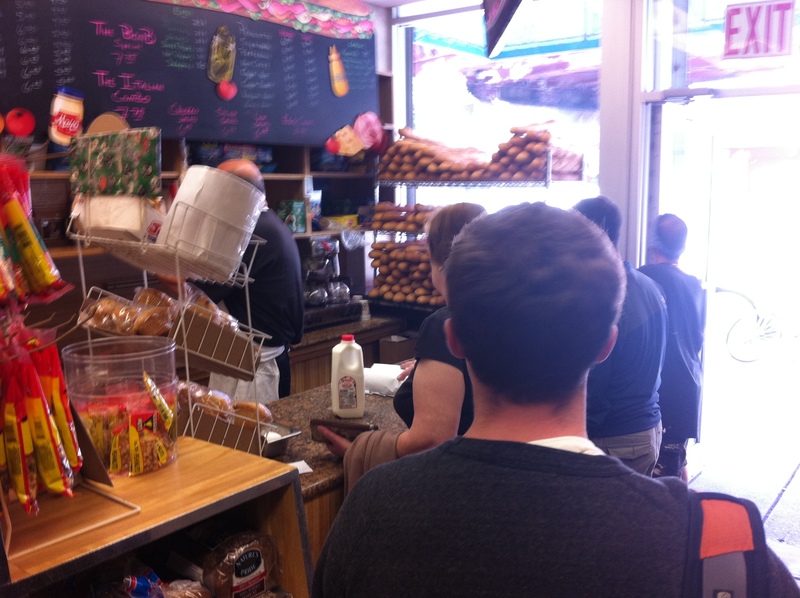 So there’s no place to sit in the deli, it’s not that kind of joint. This is a step-up-to-the-counter, make your order, and get ready to split type of joint. I was reassured by the racks of bread in the window, doubtless they burn through ’em in short order. Speaking of, I ordered the Italian combo, and then turned my attention to the cooler for a drink, where I had a marvelous shock. 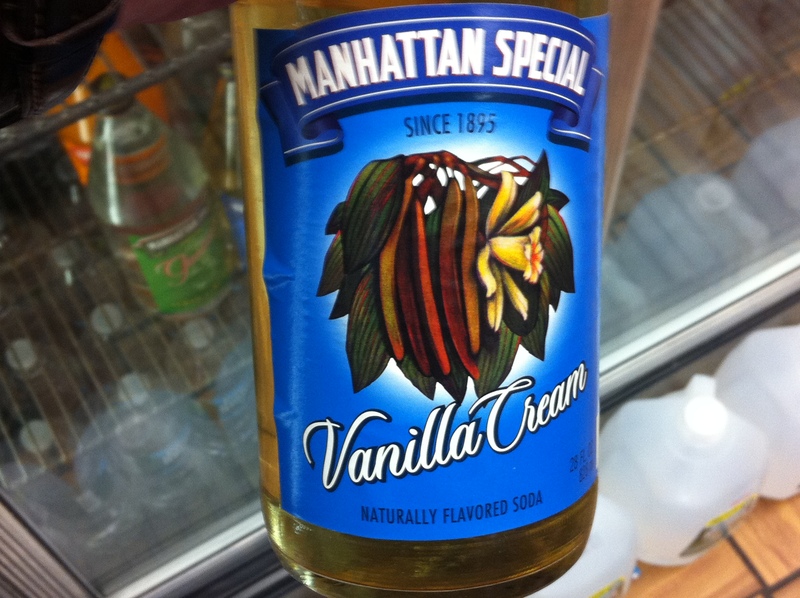 Manhattan Special in the cooler! Amazing! That, my friends, is a bottle of Manhattan Special. I grew up with the stuff and haven’t seen it anywhere in years. And this place has at least three flavors: Vanilla Cream, Lemon-Lime, or perhaps their most famous, espresso coffee. Huge props to Sal, Kris & Charlie’s for keeping it old school and having an amazing, venerable selection. Delicious stuff – very sweet, the cream – but it swept me back to my childhood, when this stuff was delivered off the back of trucks along with seltzer and more. Amazing. Wrapping one of the monsters up. I want you to look at the hero in the above image and then at the gentleman’s arm. Are you seeing the proportions correctly? Do not worry, your eyes are not deceiving you. They serve up monsters, at just $7.75 a throw. I was beginning to swoon. So how was it? Take a look at that meat bomb. It is fully loaded. Of particular interest is the ratio of filling to bread. For a better understanding of that, let’s look from another angle. As you can see, the bread at the top of the various fillings is pretty thin – just a crust soaked in oil and vinegar. The bottom piece of bread was surprisingly crunchy. In fact, I believe it may have been somewhat stale – day-old bread, perhaps? – but guess what: it worked beautifully. 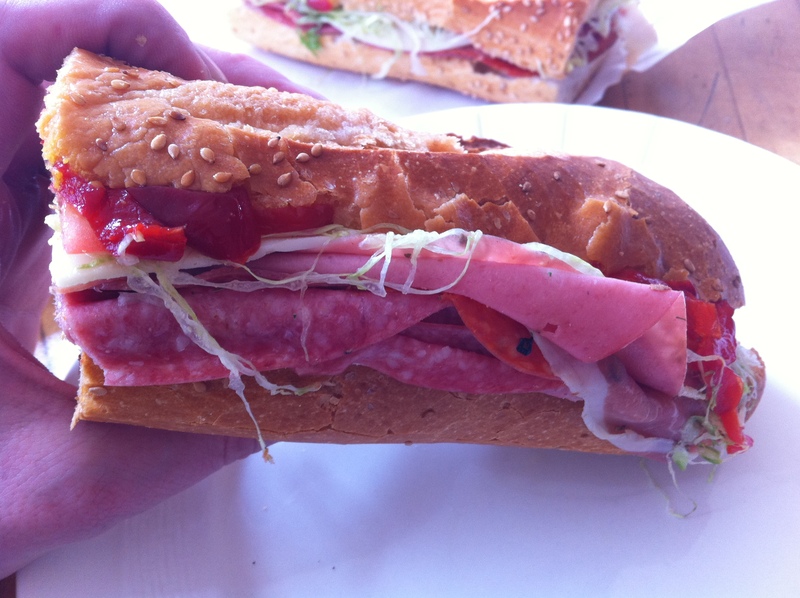 The crunch, the bread’s flavor all added to the sensational sandwich. The lettuce, sweet pepper and provolone flavors all showed up beautifully. As did all the lovely varieties of pork that loaded up the sandwich. Look, it’s a huge winner with killer bang for the buck. Strong recommend.